In 1977 I decided to try contact lens for the first time. Pre-disposable lens and soft lens, I chose the new thinner flex-lens kind. They were a pain to get accustomed to, but I finally got the trick of putting them in, taking them out, and cleaning them. 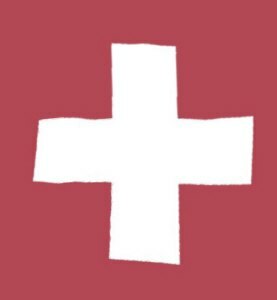 The only mishap I had with them was when my maid, Ernestine, dusted one of them away that I had placed on my dresser for a few minutes while I took a shower. Bless her heart, she never dusted again after that. But I digress, which is easy to do when I'm writing a review of a book I read so long ago. What I plan to do is to share my memories of the events surrounding my reading of Dr. Bates's book and my attempts to see without corrective lens of any kind. About the same time I had started the flex-lens, I came across this book on seeing without glasses. I read it assiduously, ready to believe it was possible and to do all the exercises. I spent time palming my eyes (covering them with the palms of my hands to rest them, doing the eye rotation exercises, and testing my eyes daily with a wall eyechart. Not much happened, but I continued anyway. Then one memorable day, my eyes cleared up - I could see clearly without glasses! Signs along the highway were readable, my contact lens were left in the drawer back home and I could see. There was a little refraction around the edges of objects, but not enough to bother me. I felt wonderful. The next day the wonderful feeling was gone because my eyesight had returned to its normal myopic state and I needed glasses or flex-lens again. What was wrong? I re-doubled my efforts at Bates' exercises and began looking around for other explanations. I found a discouraging one, but one that fitted all the facts as I experienced them: my eyes had begun to accommodate themselves to the shape of the flex-lens and retained that shape for a time after I took them off. I got one or two days like that again later while I was still wearing the flex-lens, but no longer sustained periods of good, uncorrected eyesight. Soon I switched to the very first soft lens contacts and they were a miserable failure as well. Yes, they corrected my eyesight and were comfortable, but they were also very expensive, and required replacement regularly. Plus there was one major drawback that no one hears about: wind blowing hard against one's face while wearing contacts is very uncomfortable. Seems the soft ones were slightly better for me while riding a motorcycle, but since I was using my motorcycle and convertible MG TD a lot, the contacts finally had to go since I was mostly wearing eyeglasses again. Since that time, I have refused to attempt any contact lens or other corrections of my eyesight. I wear Zeiss unifocal lens as the lightest and best vision (and most expensive) lens I could find and I am very happy every time I put on my glasses to have the correction and convenience of lens that I can take on and off at my ease, that don't pop out of my eyes and disappear, and that allow me to see comfortably and feel at ease in a strong breeze. 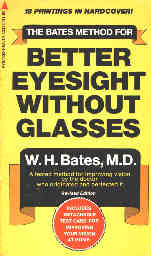 This is only my own case history of using what is called the Bates Method for "Better Eyesight Without Glasses." Since my adventures in achieving what the title suggests is possible, several new technologies have come and some have gone. Lasik surgery is the newest procedure, replacing the earlier RK surgical procedure that didn't last long enough for me to learn to spell it. With Lasik, a computer guides a laser beam to reshape the eye's seeing surface. The claims for success match those of the previous panaceas like contact lens, flex-lens, soft lens, disposable lens, RK surgery, and the current fad of Lasik. I have paid my dues back in the late 70s and early 80s. I spent a lot of money to see without glasses and came back to my old friends after the new ones were so expensive and inconvenient. As my eyeballs change shape with age, I can trust that I will be able to see clearly without having any foreign object touching my eyeballs, not even a laser beam. I can see clearly near and far, sometimes I have to remove my glasses to see very small objects up close, but I will never have to use reading glasses to read because I had my eyes corrected by laser surgery to see clearly at a distance. All those having Lasik surgery now are at the beginning of a stage I went through twenty years ago. I'll check with them in twenty years and see how happy they are with their adventures in "better eyesight without glasses." 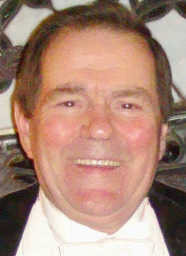 An M.D. Ph. D. in Ophthalmology contacted me from Turku, Finland where she has been doing research and treating patients since 1955, Kaisu Viikari. 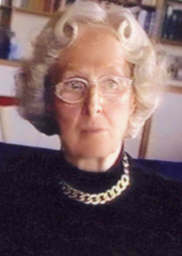 She has written several books which show that the long-term usage of minus diopter lens, the usual prescription for nearsightness, is detrimental to one's eyes and one's health in general, often leading to accommodation spasms of the eyes, intense vertical frowns in one eyebrows, and can lead migraines, macular degeneration, and retinal detachment. From her books, I learned that Only 1 in 1,000 people have true myopia caused by a deformation of the eyeball; the rest have pseudo-myopia caused by close work at a very young age without wearing plus diopter lens (reading glasses). The solution for that 99.9 % of the population of so-called nearsighted people: Simply Take Off Those Minus Lenses! Wear Plus Lenses for Close Work and allow your eyes to recover the original sightness you lost by doing close work such as filling in coloring books, reading, etc. as a child. Children need about +3 Diopter Reading Glasses when they start doing close work. Babies should NOT have Mobiles or objects hanging over their cribs to cause them to focus up close. Better to have open sided baby beds away from the walls so the baby will focus far away as possible. This will make for happier babies who will grow into happier adults. If you are an adult who did a lot of close work as you grew up, an avid reader or tinkerer perhaps, and you were prescribed minus lenses for nearsightness above the age of about 5, then you are likely pseudo-myopic and could benefit from wearing reading glasses (about +1 Diopter) immediately to relax your eye muscles, take off your negative lens eyeglasses during the bright daylight, and wearing them only when driving at night or low light situations. Use half lenses glasses with +1 Diopter is also a good solution. This protocol has already worked for me. I am now, after a few short weeks, 90% eyeglass free, without eye surgery, contact lenses, or other potentially harmful anodynes. 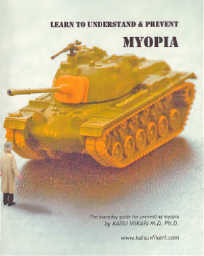 Myopia means, increasingly, frequently repeated, easily managed visits to an ophthalmologist or optician due to this complaint, profitable trade of glasses, plenty of contact lenses; and mutilation of healthy eyes that poses a risk to the eyesight and often needs to be repeated, as well as other surgical inventions, which keep an immense money-making racket going – a criminal abuse of the doctors’ knowledge, which is intended for the safeguarding of people’s health. What Evidence is There for a Claim of Criminal Abuse? Researchers tapped into a wide-ranging health survey to rate vision, comparing data for more than 4,400 people tested in 1971 and 1972 with that from another set of 8,300 people test from 1999 to 2004. This broad survey showed that 25 percent of theose examined in the early 1970s were deemed nearsighted, compared with 42 percent examined three decades later, researchers report in the December Archives of Ophthalmology. [page 2] Before perusing the theme I will be dealing with, we should take a short trip back in history to realize that myopia is not about an ordinary development trend. It is unlikely that any other consequence of evolution, if this is what we can call it, has come about as fast as myopization. We only have to remember how valuable a myopic slave was in ancient Greece, as a rare person who preserved his ability to read and do near work far longer than the majority of the population. Spectacles were only invented some 700 years ago. Given the unlikely nature that actual myopia is responsible for the increase in myopia prevalence, it must be the case that these data are revealing the increase of pseudo-myopia, which is easily prevented by the protocols that Dr. Kaisu Viikari describes in her books. Pseudomyopia is caused by nothing more than a fatigue cramp in an overworked accommodation muscle of the eye. The cramp is brought on by an insufficient opportunity for the muscle to relax (e.g. from too much reading). Pseudomyopia, being a 'spasm of accommodation' can be released. Left unattended however, the spasmic, overworked accommodation muscle will cause the eyeball to elongate causing irreversible, actual myopia. This happens especially in a young eye. Even though an actual myopia has developed, there is always some pseudomyopia included. The pseudomyopic portion of the 'total myopia' can be released, thus the worsening of the myopia is prevented and a variety of symptoms can be relieved (migraine, headaches, etc.). Perhaps instead of "criminal abuse" it should be called "criminal negligence" because eye doctors have had access to the research and methods of Dr. Viikari and chosen to ignore them. To be "criminal abuse", eye doctors would have to be choosing some more-profitable approach to eye-care which is detrimental to the eyesight and general health of their patients. In either case, eye-patient abuse by the medical profession seems evident from the statistics reported in the December Archives of Ophthalmology. It is rather unbelievable, that an esteemed medical journal writes about the situation without further ponderings of its etiology. This website by the The Francis Young, Maurice Brumer and Jacob Raphaelson Scientific Study for Threshold Nearsightedness Prevention offers information about a study of myopia reduction and prevention in Navy/Air Force pilots who must have 20/20 uncorrected eyesight in order to fly. This study lists Dr. Kaisu Viikari as an advisor. 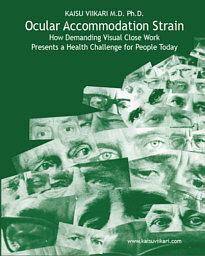 Here is the website: http://myopiafree.i-see.org/Embry.html. See for yourself is the best advice. 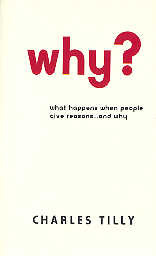 In this book, Professor Tilly gives his four categories of reasons. Using those four categories, one can easily see that, while Dr. Viikari gave numerous personal stories of healing during her decades of service to her patients, and while she gave detailed technical accounts, the people who opposed her work used the grounds of conventions and codes as reasons to ignore her work. If they had merely ignored her work, they would have deemed it worthless, but for the very reason that they attacked her work, they proclaimed her work worthy of consideration. They revealed by their actions that the danger was to their cherished profession, not to the health of Dr. Viikari's patients. Her patients' improved health is best evinced by the patients' esteem for this courageous researcher in the field of ophthalmology. One example of a patient's testimony is given below in a cartoonal and poetical tribute by Dr. János Székessy. Here are the covers of two earlier books by Kaisu Viikari. are a lesson in themselves. "THESE BOOK COVERS ARE A LESSON IN THEMSELVES." 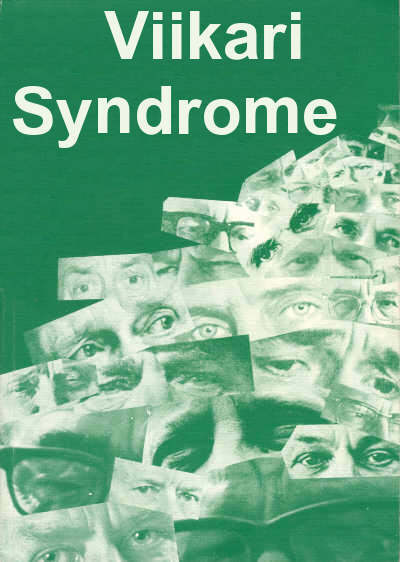 Examine them for yourself and note how the faces have vertical frowns and other symptoms of ocular accommodation spasms on the Book Cover of her book, "Ocular Accommodation Strain", and how the face on the cover of "jotta" is shrunken by the heavy minus Diopter eyeglasses. She sees these frowning and unhappy faces as correctable symptoms of pseudo-myopia caused by over prescribing of minus lenses. 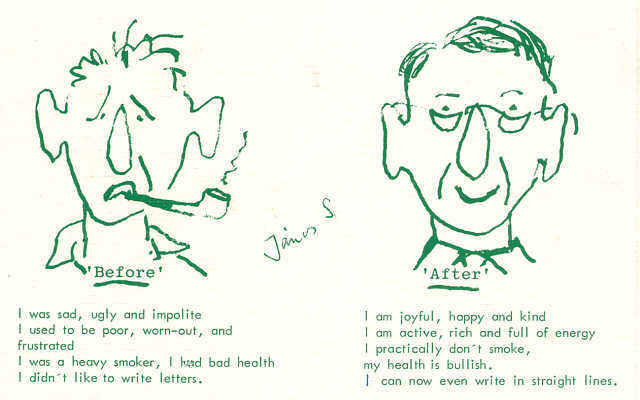 One gentleman wrote after she helped remove his ocular-caused unhappiness, "You saved my life. I am no longer suicidal!" You will recall that you were kind enough to give me a prescription to order a pair of .75 positive glasses in order to avoid migraine in later years. Now the glasses have arrived and I am happy to report to you that the result is incredible. As you will see from the following description the change 'Before and After' seems unlikely but I am prepared to testify that it is true. Cartoon Figures Illustrating Life-Changing Nature of Removing Ocular Accommodation Strain. 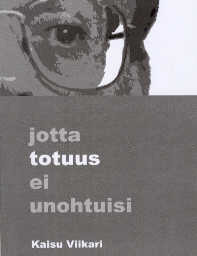 On the Rear Book Cover of Dr. Kaisu Viikari's earlier edition entitled 'Panacea' were these two cartoon faces drawn at the bottom of a letter from Dr. János Székessy. Professor Matti Saari has suggested the vertical frown or furrows be named after Dr. Kaisu Viikari because of her extensive research into identifying and relieving severe optical accommodation spasms in thousands of patients. Dr. Viikari has uniquely and incontrovertibly identified the etiology of the vertical frown as a result of long episodes of severe accommodation spasm, which her research indicates can lead to various severe medical conditions. The facial feature may be a simple curved line or a deep furrow but it remains as a visible feature so long as the spasm continues. Her success with treating these medical conditions, especially migraine headaches, by adjusting eyeglass prescriptions led thousands of patients to treatment in her surgery in Turku, Finland. They came from all over Scandinavia and Northern Europe. The Viikari furrow is one sign of the Viikari Syndrome which comprises a complex of presenting indications.